New Jersey based CellSwapper is a cool service that came at just the right time. The site, which calls itself “the eBay of cell phone contracts” takes advantage of the fact that all U.S. cell phone carriers have clauses in their contracts that allow users to get out early, without the early termination fee that can range up to $250 per phone, just by transferring your account to someone else. 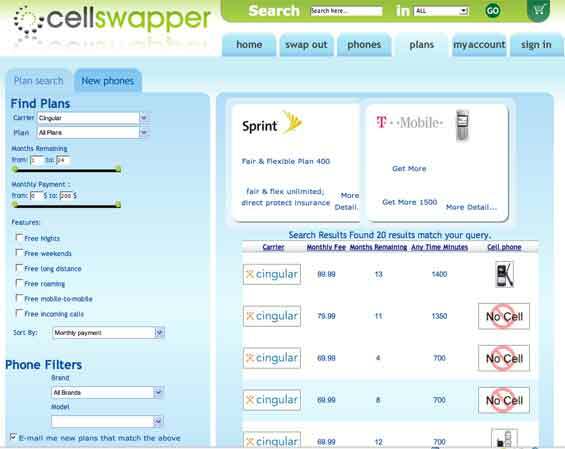 Of course, finding someone else to take over your cell phone contract isn’t easy, and that’s where CellSwapper comes in. The recipient avoids activation charges on a new account of $40 or so, and often the transferring party gives extra incentives. In going through the listings, there are many offers of giving away the phone with the contract, and/or a cash incentive as well. CellSwapper charges $15 to the transferring user if a successful transfer takes place. There are no other fees. I say this is coming at exactly the right time because a lot of people, myself included, are going to be looking for a way out of their cell phone contracts this June when the new iPhone is released with Cingular. I will happily give someone my Motorola Q (good riddance) plus $100 to avoid the Verizon termination fee. Success for CellSwapper depends on their ability to build a network of buyers and sellers fast. We’ll check them out again in a couple of months and see how they’re doing.